Lesson 3 – How to Measure Animal Behaviour. This is true in business and when Training Animals. Measuring behaviour when Training Animals is a concept many people initially struggle with. To make it easier to understand it’s beneficial to examine how we as humans communicate to each other. When talking about Animal Training it’s highly beneficial to develop a common language. I generally encourage not using labels when training animals (e.g. Happy, Angry, Sad, Aggressive). Instead of using labels I suggest describing what you can see and hear your animal doing. For Example, rather then saying the dog was happy. Or the dog was excited. Or the dog was aggressive. We could say, the dog ran up to me. Tail wagging. Ears up and forward facing. And tongue hanging out to the left of his mouth. By eliminating labels we also eliminate differences between people’s opinions on behaviour. People can disagree wether an animal is happy or sad. People can not disagree however that the bird has dilated pupils, raised feathers and is leaning to the left. How you can improve your success. with one small technique. There are three labels I use when working with behaviour. These three labels are Desirable, Undesirable and Acceptable. We start of by defining what specific behaviours look like. We describe the behaviour in relation to what we can see and hear. For example, one of the behaviours in this lesson’s video is “standing up and huffing/hissing. “ Then we can assign individual behaviours to one of the three labels categories. Let’s use the “standing up and huffing/hissing” behaviour as an Example. In the video we decided as a team that this behaviour was “Undesirable.” This technique works well in a team environment. Each individual animal ends up with a list of behaviours. Each behaviour falls into one of these three categories. We then measure behaviour by the frequency it occurs. As a team we work to maximise desirable behaviours. We work to minimize undesirable ones. This helps us set goals. Measuring behaviour becomes straightforward. Ultimately we are much more easily able to measure our success. Watch this lesson’s video. 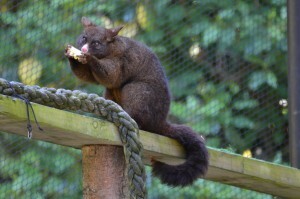 With an Australian Brush Tail Possum as an example, you can see how we implemented the above. If you have completed this lesson click the button below to make as complete so you know for future reference. A collection of video and content surrounding all areas of Animal Training. A short lesson about the importance of Environmental Arrangement and Animal Training. Learn about being creative in your training endeavours. Learn about the importance of setting your animals environment up for success. This lesson, shares my story and touches on how to get into animal training. A lesson describing the process of writing a good training plan. Learn about decisions I make as to when I use a clicker. Learn about the application of Positive Reinforcement. This is a lesson that teaches you a simple thing you can do to help improve your training skills now! Learn about building partnerships with your animals. In this lesson you will learn about empowering your animals and developing trusting relationships. In this lesson you will learn about target training your animals. In this lesson you will learn some quick crate training tips you can employ with all animals. In this lesson you will learn about short windows of opportunity. In this lesson you will learn about practicing your patience. This lesson explains what competing reinforcers are.